Here's one to add to your toolbox, especially for people who do a lot of consumer oreanted tech support. 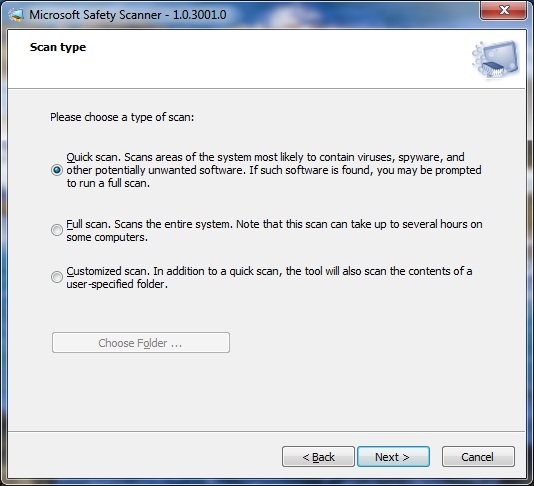 The recently released Microsoft Safety Scanner. It's a self-contained anti-malware scanner, the kind which is handy to run off a USB drive to scan someone's computer. No installation or internet connection is required, as most sophisticated malware will block installations of known anti-malware and block internet access to various websites. But copies you download are only good for 10 days before you have to download a newer version. 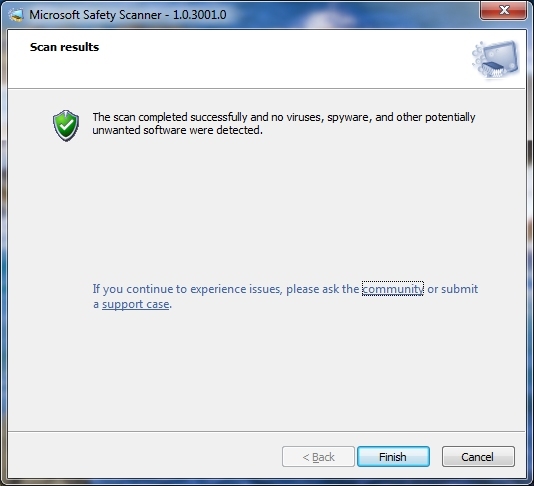 Here it kindly reminds you that it is not a replacement for a resident anti-malware scanner. 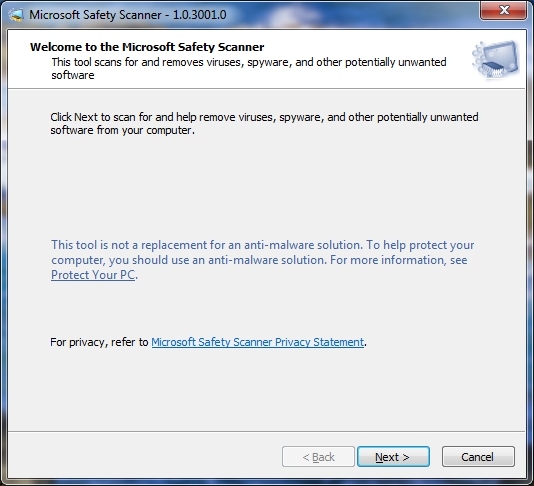 I'd recommend Microsoft Security Essentials for that. 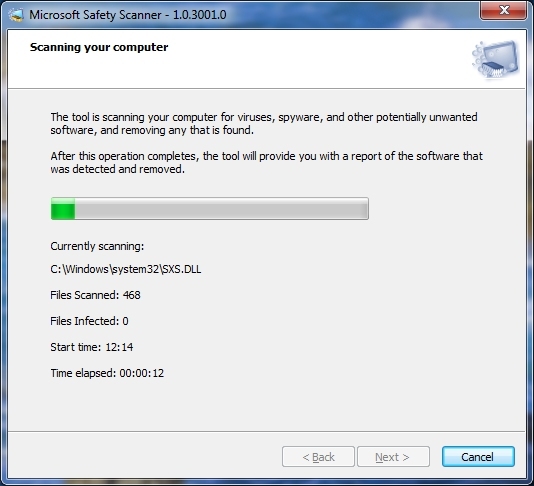 Standard sort of options, quick scan, where malware is most likely to be located, complete and of course a custom scan. Nice and simple. Like I said only draw back is you have to replace it every 10 days. With it using the same scanner as MSE and Forefront it'll undoubtedly do a decent job of things. This week's news of Google transitioning away from Windows to Linux or Mac OS has spread its way across the internet, Google cite security reasons for the move. But is that the only reason behind it? The answer is no. First up, we're talking about Google; of course they would rather run their own in-house stuff. Primarily Linux, they use that as the basis of Android and Chrome OS, their servers run Linux. It should come to no surprise that Google from a corporate level would prefer to be seen running their own stuff, or if not their own at least not the stuff of their main competitor - Microsoft. That in my opinion is the main reason behind it. The security excuse they chucked out is FUD pure and simple. Microsoft or Windows aren't at fault for Google being hacked back in January. Google got hacked because their IT administrators allowed a 9 year old browser on their machines, running on a 9 year old operating system. I tell people almost daily, upgrade your browser, and if you can afford it look at moving to Windows 7. If they had proactive IT administrators, ones who roll out updates within days of their release, or ones who through group policy prevent unpatched machines getting onto the network this would not have happened. Heck IE8 was blasted onto all my machines within hours of release. Testing compatibility with the machines or their own systems could be done during the public beta. For Google, a so-called leading internet company to be using a nine year old browser is embarrassing. Of course Google were quick to blame Microsoft for the problem, why wouldn't they? The fact it didn't effect Windows Vista or up, or Windows XP with IE7 or up was irrelevant, they needed some FUD to spread. This new story is just part two of their FUD campaign, and they're almost getting a free pass with it. Google could deal with all their security problems by moving to Windows 7. They might as well even use their own Chrome browser if they want, it is pretty respectable. Moving to Linux is certainly not going to solve their security problems, and giving their workers the option for Mac OS in addition is only going to be a total security disaster with how insecure that is. Security wise, Mac OS X is a joke, it consistently falls first in any test. Linux is respectable security wise, although it has far more vulnerabilities than Windows, and is more difficult to maintain, and let's not even talk about usability. Microsoft since the release of Windows Vista back 2006/2007 has had a very good track record on security, to the point where exploits on Windows aren't targeting Windows itself anymore, they're targeting Adobe Reader, Flash or QuickTime because exploiting Windows itself is too difficult these days. For Google to cite security is laughable. So Internet Explorer has been the media's main victim this past week. With stories about how it is completely unsecure. Of course having a vulnerability isn't a good thing, but why is this getting so much attention, especially considering it's not even being used to target individuals? Well I suppose the media have to knock Microsoft, it's about the only thing they can do when it comes to Microsoft so this will have to do. Tech Radar recently interviewed Microsoft's head security guy in the UK Cliff Evans. And did a pretty bad job of it. So Evans was explaining how switching away from Internet Explorer 8 isn't a good idea - something I agree with. "If you were to ask me 'what's the most secure browser?' I would say Internet Explorer 8 – we're talking about a single vulnerability," he added. That's the funniest thing I've read in ages. Of course what he really demonstrates is how little richmurrils actually knows about technology or security, I expect he was one of the people telling people to turn UAC off /facepalm, and how Tech Radar can't report things in context. So I'll put things in context even if they can't be bothered to, Firefox 3.5 has had at least 35 documented security vulnerabilities. Linux based operating systems can have hundreds of vulnerabilities discovered each year, Windows historically has had the fewest usually at just a dozen or two every year discovered. A single vulnerability isn't anything unusual. Of course nobody bothers reporting that this vulnerability can only be exploited on Internet Explorer 6, a 10 year old version and on Windows XP a 10 year old operating system. Do Mozilla even bother to support such old products? Of course not. Alright sure the vulnerability still exists in later versions, but it cannot be exploited on newer systems because of the additional security measures Windows Vista and later provide. Namely Protected Mode made possible by UAC. Why Safari? Why didn't you go after IE or [Firefox]? It's really simple. Safari on the Mac is easier to exploit. The things that Windows do to make it harder (for an exploit to work), Macs don't do. Hacking into Macs is so much easier. You don't have to jump through hoops and deal with all the anti-exploit mitigations you'd find in Windows (Vista and later -Paul). Of course 3rd parties could use Protected Mode on Windows Vista and later like IE7 and 8 do. But Mozilla, Opera and others simply don't bother. They let the process run with the same rights as the user which is fundamentally less secure then running the browser in its own little sandbox where it can't get out. In reality vulnerabilities like these are rarely what normal people come up against on the internet. The main problem is phishing and malware. Both of which are socially engineered to get the computer user to either hand over their data willingly or willingly install an application that's malicious. So how does Internet Explorer compare? IE8 blocks 83% of phishing websites completely, compared to Firefox which blocks 80%. While Internet Explorer 8 blocked 81% of malware before it reached the machine. Firefox blocked less than 30%, and other browsers scored even worse (source). So not only is it more difficult to exploit vulnerabilities on Internet Explorer 8 on Windows Vista and up. 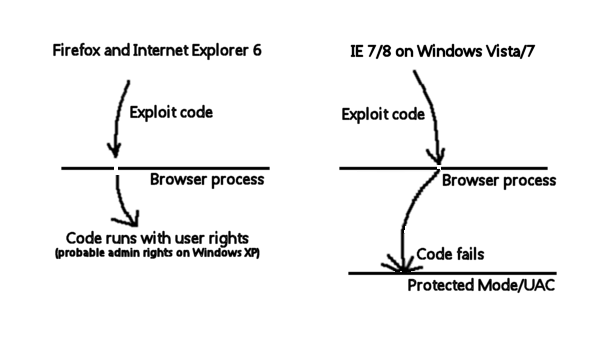 The malware and phishing filters are also better on IE8, something that will protect most computer users. One last comment is on how well Google and the media have spun this around from a story about how Google got broken into and people's personal data was stolen into a story about how a 10 year old browser on a 10 year old system has a single vulnerability, without even asking why Google are running such dated systems or without bothering to report that newer versions of IE aren't as susceptible. Nice spin department working there. Update: Mark informed me that Chrome also runs in a sandbox. The BBC have a headline that reads "German government warns against using MS Explorer". Well that's no problem, as I've never even heard of an MS Explorer. Of course what they're really going on about is Internet Explorer, and how version 6 was used to compromise Google's systems. find an alternative browser to Internet Explorer to protect security. Who knows what "protect security" actually means. Perhaps they mean protect their systems, or improve their security. Seriously who wrote this article? What they should really be having a go at is what sort of incompetent system administrators would be using a 10 year old browser on a 10 year old operating system. Ed Bott says such administrators should be guilty of malpractice. And I agree with him, what sort of people are running the IT departments of companies like Adobe and Google to allow such dated technology on the network. Even three year old systems like Windows Vista and Internet Explorer 7 in the default configuration are immune to this sort of attack. And it is just amazing that this has somehow been spun into an anti-Internet Explorer story when the real story is how can we trust Google with our data in the cloud when they're running such antiquated systems? I've had a couple of people e-mail me asking what they should install on their new Windows 7 computers since some of the firewalls and anti-virus software they've used in the past aren't compatible. Long time readers of my blog will know the epic battle I've always had with anti-virus. To the point where during the Windows Vista timeframe I didn't run anti-virus. Obviously I don't recommend the average computer user to do that. But I could never find any anti-virus software that was both free, fast and not annoying. In Windows XP you could tolerate anti-virus and 3rd party firewalls constantly nagging you and having annoying spinning icons in the system tray. In Windows Vista because the OS experience was so much cleaner than Windows XP anti-virus software like AVG or Avast always seemed drastically out of place and frankly noisy and annoying. 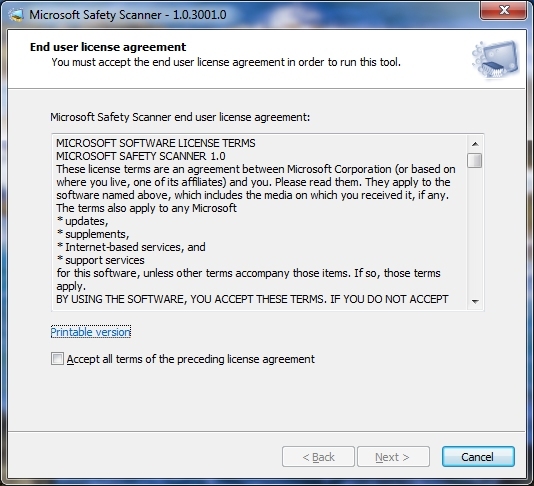 I was thrilled when Microsoft announced they were dropping Windows Live OneCare, a rather heavy security suite and replacing it with what was then codename Morro, now Microsoft Security Essentials. Why? Because it promised and delivered a Windows Defender-like anti-virus solution, namely fast, nag-free and out of the way. I would strongly recommend to everyone Security Essentials. It's a lightweight, fast and nag-free anti-malware application. Meaning it deals with viruses and spyware. In my opinion there is no competition anymore in the free anti-virus space, this is it. Even if you've just brought a Windows 7 PC and have a trial version of Norton or McAfee I'd even recommend removing them and installing this instead. As for a firewall. Post Windows XP SP2 this is really a non-issue. I'd recommend using the built in firewall. There's no need to clutter the machine with anything else. And finally as a first line of defence against phishing and driveby malware if you're running Windows 7, you've already got Internet Explorer 8 there. Great. From a security standpoint there's no safer browser. If you're still on Windows XP or Windows Vista I'd suggest upgrading now. I know most of my readers use Firefox and that's fine for more tech-savy users. But I wouldn't recommend it for your average computer user, the data is clear, For phishing Firefox blocks 80% while IE8 blocks 83% and more malware in general Firefox catches less than 30% (other browsers were even less). Internet Explorer 8 was blocking 81%. In short: Use Internet Explorer 8. Use the built-in firewall and install Security Essentials. Microsoft are going to be releasing Security Essentials later today, for those that don't know this is their free anti-virus, anti-spyware, well anti-malware in general application. I've been running it for a few months now on all my systems, and the short review is this: it's the best anti-malware software ever, it doesn't slow your system down noticibly and it isn't constantly bugging you with pop-ups like other anti-malware software. My recommendation is this: If you're using Norton or McAfee, stop giving them money, uninstall their terrible products and replace it with this. Check out my other coverage of it here. Keep an eye out on the Security Essentials website for the download links.